—This feature is an excerpt. To read the full-length feature in all it's splendor, subscribe to Pure Green. 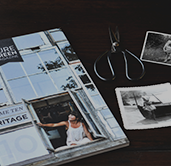 We're so pleased to be featuring a longtime friend to Pure Green, the lovely Tara Hurst. Tara is a creative director and stylist whose modern, minimalist style has us swooning every time and excited to see what she is working on next. Tara lives and works on Vancouver Island, a beautiful locale whose microcosm of charm and culture is sure to draw you in every time. Over the past year she and her husband have been renovating a 100-year-old home and the result is truly lovely. Tara also maintains a lovely blog as part of her creative work—our favourite is her Creative Q&A series, be sure not to miss it! YOUR HOME IS A REFUGE OF PEACE AND QUIET—I'M SURE LIFE DOESN'T ALWAYS GO LIKE THAT, BUT IT TRULY DOES SEEM LIKE A SPACE CAREFULLY CREATED TO EMBRACE SLOW LIVING. WHAT ARE SOME OF THE THINGS THAT YOU DID TO ACHIEVE THIS FEELING? Finding ways to create peaceful and creative experiences at home really influences how our everyday life takes shape. Every room has a purpose and thinking about how you want to feel in your home is a great place to start. I really want to feel inspired in our home and slow down to enjoy meaningful experiences. To achieve this you really have to question what might be creating distractions in your home. Is it clutter or maybe technology? For example, the focus of your living room really shifts if a television is the focal point. Our living room is filled with books, inviting us to curl up in the window, read and just slow down after a long day. We also eat dinner together every night in the dining room. It might sound a little formal or old-fashioned, but taking that time to prepare a healthy meal and enjoy it without any distractions is something that we really value. HOW DO YOU STRUCTURE YOUR DAY, START TO FINISH, IN ORDER TO MAINTAIN THE CALM AND GRACE THAT YOUR HOME EXUDES? DO YOU HAVE ANY COPING MECHANISMS FOR WHEN STRESS STARTS TO BUILD? My day has become quite routine over the years. I wake up at the same time each morning to the kettle whistling while my husband Michael is out walking our dog Zadie. I make coffee while I listen to the CBC. Most days I head downtown on my bicycle for meetings or to work from my client’s office. I really enjoy riding my bicycle around town, especially at the end of a long day. On days when I don’t have to be downtown I hide away in my studio. Those days tend to be my most productive and I cherish the flexibility to be able to work from home. As I mentioned, having dinner with my husband is also a priority. There’s something about recounting the day and having some time alone together. After dinner, we usually spend a little time on our own and we are always in bed early during the week. My best coping mechanism when stress starts to build is to drive down to the beach by our house with Zadie and walk along the shore. Depending on what I’m working through, I’ll walk the beach several times until I’ve calmed down, or sit on the beach and just watch the waves. Living on the island, I’ve definitely developed a connection to the ocean. WHEN ADMIRING THESE PHOTOS, YOU CAN PLAINLY SEE THAT THERE IS A STRONG EMPHASIS ON YOUR BEAUTIFUL FRONT GARDEN, WHICH IMPLIES THAT GARDENING IS SOMETHING THAT BRINGS YOU HAPPINESS. WHEN DID YOU FIRST BECOME INTERESTED IN CULTIVATING A GREEN THUMB? When we moved into our house last year I was so excited to finally have my own garden, but I really had no idea how quickly I would become completely obsessed with it! My childhood was definitely intertwined with gardening. My grandparents were both avid gardeners from England and I can remember helping my Grandpa pick vegetables from his city plot in Toronto or looking at my Nana’s still-life paintings of flowers. My sister and I loved playing in their garden as little girls. I also loved Beatrix Potter. I still do, really. I think that in many ways a vivid imagination lends itself well to an aspiring gardener—it’s magical and so rewarding whether you’re growing peonies or golden beets. KELLY BROWN: Using a natural light approach with a focus on seasonal beauty, Kelly's work reflects a creative life rich in all the things that nourish us from food to flowers, from the moments that mark our history to the ones that make each day sweet. When she is not photographing, she spends her days preparing thoughtful meals, gardening, hiking, and working with her husband on their natural building company, dreamweavers collective. View more of Kelly's work: kellybrownphotographer.com. INSTANTLY READ THE FULL FEATURE, SUBSCRIBE TO PURE GREEN! Step into our world—explore what it means to live an inspired, conscious life.